Given Minecraft’s simplest summary is “Lego on your computer”, it’s both inevitable and appropriate that Lego would develop the first and so far only real rival to Mojang’s behemoth. Lego Worlds has been in Early Access for a year now, but as of now it finally has a date for its official launch: February 24, 2017. Any good? 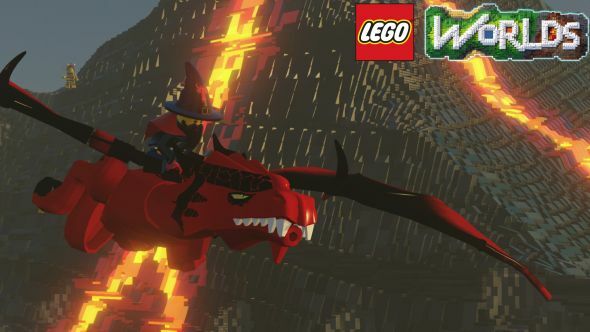 Here’s our review of Lego Worlds’s early access version. As with Minecraft, players use an assortment of tools and bricks (but with a Lego aesthetic) to build and customise environments, structures, vehicles and more. Pilotable vehicles include helicopters, motorbikes and machines of the more organic and fantastical variety, such as bears and dragons. Lego Worlds will also have narrative elements, with players able to help other Lego characters in RPG-style quests: find a sword for a king, protect a farmer from a zombie invasion, or build a home for a caveman. They’re all steps on your way to become a Master Builder (whatever that means). As with Minecraft, you’ll be able to play in your friends’ worlds (split-screen or online), share creations with one another, and even “unlock and play with your physical Lego sets in a whole new way” – clearly suggesting you’ll be able to use and customise physical Lego sets in Lego Worlds. If you can’t wait to join in the fun, feel free to get involved in Lego Worldsvia early access right here. It’ll cost you £11.99 (or $14.99 US).